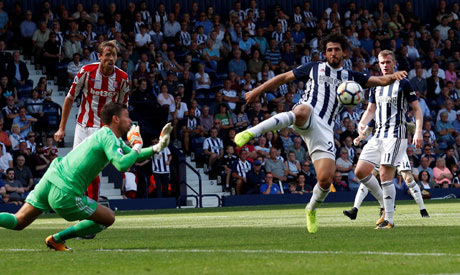 Egypt defender Ahmed Hegazi has praised West Brom’s new approach of play as the team is trying to control the ball more and build up play with defenders to improve their game and clinch an automatic promotion spot to the Premier League. “We have got very good attacking players, and by bringing the ball out from the back we are trying to give them the best chance possible to show their qualities. Sometimes we get punished with this system but we will keep working at it and I feel we’re doing better all the time,” Hegazi told the club’s website on Monday. The 28-year-old defender made a crucial assist to Dwight Gayle that gave them a precious 1-0 away victory at Stoke City on Saturday. The victory put them in fourth place with 53 points, seven behind leaders Norwich City, and they have played a game less in the battle for a top-two spot which brings an automatic promotion to next season’s Premier League campaign. “It’s a very, very tough league. Any team can beat any team. The towering 1.95m defender has been a key player since joining the Premier League side in summer 2017. He remained at West Bromwich despite relegation, vowing to bring the team back to the top flight. He established a solid partnership with Craig Dawson at the heart of the Baggies’ defence. “I feel very comfortable when Craig and I play together. We have carried on from last season and Craig has been good for me with his experience with the team and the club over eight seasons now. He has helped me a lot and that has helped us play well together. “But I have to say the boys we have added this season are doing very well too. With Kyle and Tosin, I feel any one of us can play in any combination. “We know we have to keep clean sheets over the second half of the season and we have spoken about this a lot. If we can achieve this, it would make the run-in easier for us,” he concluded. So far, West Brom have conceded 38 goals in 30 matches and are the third best defence in the championship behind Sheffield United, third on the table, who have conceded 34 goals in 31 matches, and second-placed Leeds United, who have conceded 35 goals in 31 matches. The Baggies will play Nottingham Forest on Tuesday at home.